HTC designed the first Android phone on the market (the T-Mobile G1 also known as the HTC Dream) and regularly puts out branded smartphones while also collaborating with Google on its flagship series. In 2017, Google acquired part of its mobile division team, which had already been working closely with the company on Google's Pixel devices. The HTC U series is a line of high-end and mid-range smartphones that are available internationally, though not always in the U.S. Here's a look at the latest models. The HTC U12 Life removes the squeezable sides that the U12+ has and features a shiny purple or blue body that reviewers say is a fingerprint magnet. It comes in 64GB and 128GB configurations and you can insert a microSD card for even more storage. The Phone also retains a headphone jack, a rarity these days. It also has a fingerprint reader on the back. The U12 Life will sell in Europe but not in the U.S. or Australia. The HTC U12+ is the company's latest high-end smartphone, and it will upgrade to Android P (9.0) once the OS update is available. Its slim bezel is 2 mm narrower than the U11's, and the display has an 18:9 aspect ratio which expands screen real estate. Like the U11+ it has HTC's so-called liquid design, which is a glass and metal back that looks like liquid and shimmers when it catches the light. The phone has Edge Sense 2 technology, which enables you to squeeze the phone's sides to activate Google Assistant or Amazon Alexa (no HTC Sense Companion to be found), or to turn on the Accessibility Talkback screenreader feature. You can also double-tap one side to shrink the screen so you can use the phone one-handed or program any action you want. The company's help page suggests using it as a back button or setting it to display a floating navigation bar. Holding the sides prevents the screen from dimming or rotating, convenient for when you're lying down. Edge Sense 2 is compatible with millions of Android apps. The camera has 2x optical zoom, optical and electronic image stabilization, and faster autofocus. Like the U11, it supports AR stickers. The smartphone doesn't have a headphone jack, but it comes with a pair of USB-C USonic earbuds, which have active noise cancellation. HTC does not include a USB-C to 3.5 mm adaptor in the box, so you'll have to provide your own if you want to use headphones that don't have a USB-C cable. It's the first smartphone in the U series to support Bluetooth 5.0. The H12+ comes in 64 GB or 128 GB versions and has a card slot that can accommodate up to 400 GB. The HTC U11 EYEs is a selfie-centric smartphone. The front-facing camera has dual sensors to create the bokeh effect in which the foreground is in focus, and the background is blurred. It also lets you focus and make edits (skin smoothing and the like) after shooting the picture. You can also unlock the U11 EYEs using facial recognition. To continue the selfie theme, HTC added AR (augmented reality) stickers, which are cartoon animations that you can add to your photos, such as hats or animal noses (think Snapchat filters). The stickers are available on the primary camera too. It also features Edge Sense technology, which premiered in the U11, and offers a unique way of accessing apps and features on your phone: by squeezing it. Once you set it up, you can squeeze the sides of your phone to open the camera, for example. It can also be used alongside Face unlock by squeezing the phone while your face is in view. The U11 EYEs also has the Edge Launcher, which is a wheel of shortcuts on either the right or left side of the screen that you can call up using Edge Sense. It also comes with a virtual assistant called Sense Companion, which pushes out notifications based on your actions, location, and other factors, such as the weather. For example, it will remind you to grab an umbrella if it's threatening rain in your area or prompt you to charge the device if the battery is running low. The Sense Companion integrates with Boost+, HTC's battery, and RAM manager, and it will seek out rogue apps that are using too much juice in the background and shut them down. Like the U11+ it has HTC's eye-catching liquid design. It also has a slim bezel and an 18:9 aspect ratio which expands screen real estate. It features mid-range specs in comparison to U11+, when it comes to the chipset, display resolution, and speakers. Thankfully, it retains the U11+'s large 3930 mAh battery, which should last all day. The fingerprint sensor is on the back of the phone, not the front, as it was with earlier models. There's no headphone jack, but a USB-C adapter is in the box so you can use your preferred wired headphones. Note that the adapter that HTC sells will work only with HTC devices, and third-party adapters are not compatible with HTC smartphones. The company also includes a pair of USB-C earbuds, which incorporate USonic technology. When you put them on the first time, a setup wizard will analyze your ears and enhance audio playback. You can also prompt USonic to readjust the audio if the noise level around you changes. The HTC U11+ won't officially launch in the U.S., but it can be purchased directly from HTC. The smartphone features a slim bezel and a glass chassis and looks more modern than its predecessors. (Be careful, the glass can be slippery; a case is probably a good idea.) The fingerprint scanner is on the back of the phone, unlike earlier models where it shared the home button. It also has solid battery life but doesn't support wireless charging. It features Edge Sense functionality, like the U11 and U11 Life, but adds the Edge Launcher, which gives you access to app and settings shortcuts. The Sense Companion virtual assistant is built-in, which offers personalized notifications based on your actions and the information you share with it. This smartphone doesn't have a headphone jack but comes with an HTC USB-C adapter and USonic earbuds. The U11 Life is available in two versions. The U.S. edition has the HTC Sense overlay, while the international version is part of the Android One series, which is a pure Android experience. The phones also have different RAM, storage, and color options. Like the U11, it has Edge Sense technology and is fully water and dust resistant. HTC Sense adds software including the Sense Companion virtual assistant, Amazon Alexa, power-saving mode and gesture controls. The Android One version does not have these features, but it's compatible with Google Assistant, which a user can launch by squeezing the sides of the phone. The fingerprint scanner doubles as the home button, same as the U11, U Ultra, and U Play. The HTC U11 has a glass and metal back, which is a fingerprint magnet, but it comes with a clear plastic case so you can enjoy the look without tarnishing it. The home button conveniently doubles as a fingerprint sensor and the U11 is fully dust- and water-resistant. It comes with the Sense Companion virtual assistant and is the first phone in the series to feature Edge Sense technology. It's also the first to support Google Assistant and Amazon Alexa. The phone doesn't have a headphone jack, but it comes with USonic earbuds and an adapter so you can use your pair. 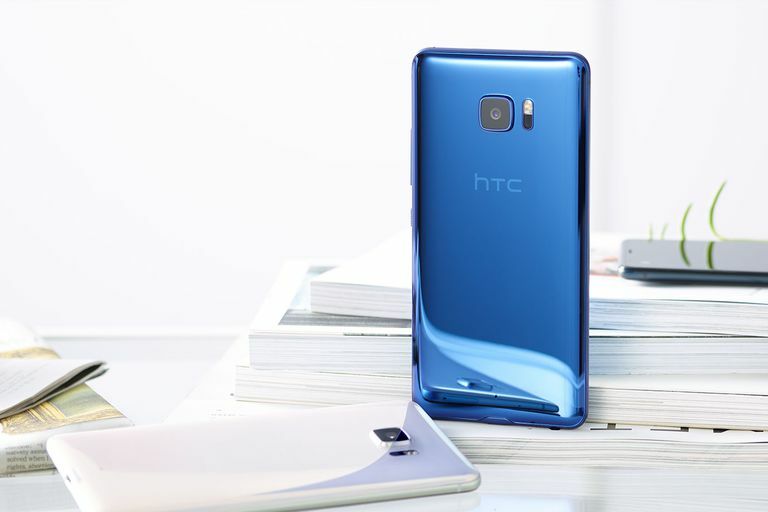 The HTC U Ultra is a high-end phablet with dual screens; the primary screen where you'll spend most of your time, and a smaller (2.05 inches) along the top that shows a handful of apps icons and is reminiscent of Samsung's Edge screens. The small screen lets you see notifications when you're using another app. You can customize it too, choose which notifications you want, such as weather and calendar, and add your favorite music app so you can easily pause or skip tracks. This smartphone has HTC's Sense Companion virtual assistant built-in, and you can opt to have your notifications show up on the secondary screen. The Sense interface isn't too intrusive, adding gestures, such as double-tapping the screen to wake it up. Like the U11, the U Ultra has a glass and metal back panel. It's attractive, especially when it catches the light. The U Ultra lacks a headphone jack but comes with HTC earbuds. You'll have to buy a USB-C adapter from HTC if you want to use wired headphones. The phone doesn't support wireless charging. HTC leaves out the headphone jack on this smartphone, but it also doesn't include a USB-C adapter in the box. You can buy one from HTC, but you can't use third-party dongles. As we said, the HTC U Play doesn't have great battery life, but there are a few power-saving modes to make up for that. The extreme mode limits you to a handful of apps, useful if you're running on fumes.